The government has tentatively begun to sell cotton reserves it bought from farmers, valued at an estimated $32 billion. 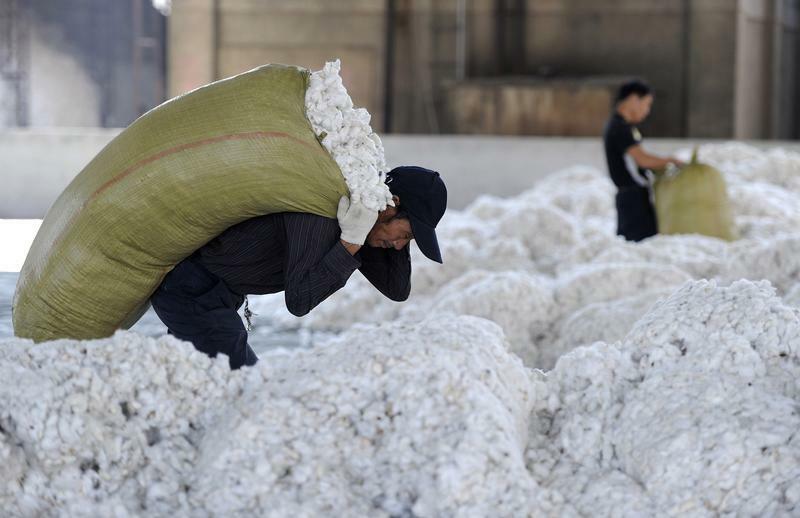 If a recent promise to give markets a “decisive” role were sincere, China’s domestic cotton industry would be hobbled. Theory and practice are still far apart. A worker carries a sack of cotton at a cotton purchasing station in Wuhu, Anhui province, October 2, 2012. China, the world’s biggest consumer of cotton, sold 12,312 tonnes in a new round of auctions on Nov. 28, according to an announcement by the state reserves manager. The sales, designed to chip away at China’s huge stockpile, were about half the total offered. The minimum price for the sale was set at 18,000 yuan per metric tonne, compared with a price on the IntercontinentalExchange of around 10,300 yuan per tonne on Nov. 28. China’s stockpiles were estimated at 50.4 million bales, or 10.8 million tonnes at the end of July, according to the U.S. Department of Agriculture – the result of a three-year buying programme designed to protect farmers from falling prices on global markets. That represented over half of the world’s total estimated stockpile. China produces around 7 million tonnes of cotton a year, compared with global production of just over 26 million tonnes, according to Department of Agriculture data. More than half of Chinese production comes from the western region of Xinjiang.